Despite the apparent natural progression of a child’s language acquisition, this model assumes that, at the very least, there is an equal input from the social in this process. Adults play a crucial role in providing language models for children, in helping to teach language through asking questions, restating phrases and so on. It is a social, interactive process, such that language development is best described as active construction, not passive acquisition. The role of the adult in offering models, and guiding in the construction of texts with children, has been taken by genre theorists to be the pattern through which language learning can be achieved in schools. The [Genre] curriculum cycle attempts to engage students in an awareness of the social purposes, text structure and language features in a range of identified text types or genres. Paralleling the insights into early language development, the cycle involves phases of modelling, joint negotiation and independent construction. The rationale for this pedagogy is based upon studies of parent-child language interactions, which show that rather than language acquisition being a ‘natural’ process of osmosis, it is really highly interventionist. When we think about the proportion of teachers who are also parents, it is difficult to understand how it could ever have been thought to be otherwise. Parents, of course, have an enormous advantage over teachers in terms of teaching language — that is the factor of time. Teachers have only a small fraction of the time for individual language interaction that parents have. For this reason, teaching strategies in the classroom must be far more explicit and efficient than what happens in the home environment. It was always the intention that the cycle be a guide to developing a sequence of lessons rather than a fixed procedure. This enables entry into the cycle at any point, depending largely on the language competence of the students in relation to the language activity being taught. This requires that teachers be clear about the reasons they are in any one stage at any particular time. It also requires that teachers be precise with their students with both the stage and outcomes of each classroom activity. In other words, we would argue that teachers do not have the luxury of sufficient time to be able to give vague directions such as ‘go and write a story about such and such’ and then sit back and see what happens. The more clearly defined each language activity, the more specific each of the learning outcomes for the activity can be. Because writing is such an important part of the education process, it simply cannot be left to ‘hit and miss’ strategies. One of the fundamental aims of this curriculum cycle, therefore, was to specify what some of the stages in an effective and efficient writing program might be, and beyond this, how they might be managed with large and small groups of students. The first stage of the curriculum cycle is ‘modelling’. A key insight of genre theory is that language occurs in a social context and that it is structured according to the purposes it serves in a particular context and according to the social relations entailed by that activity. This is important because the notion of genre is sometimes misrecognised as a basis for arbitrary impositions on childhood creativity. It is not linguists or teachers, however, but the social context which ‘imposes’ certain requirements. Therefore, it is necessary for students to understand the context of a given interaction in order to understand the purpose of a genre. The context, therefore, can be specific to either an educational setting or subject (such as the scientific ways of describing animals, for example), or a wider social activity (such as newspaper articles, procedures for recipes, discussions among friends). Social context is one possible starting point when teaching students a new genre. A number of model texts can be used to draw out the significant features of the genre: those things which make a report a report, or a discussion a discussion and not a procedure. In the modelling stage, the social purpose, text structure and language features of the genre are investigated. At the second stage of the curriculum cycle, ‘joint negotiation’ of a text, students (usually as a class or group) begin writing in generic text types. This involves a period of preparation with the close guidance of the teacher, who provides support and ‘scaffolding’. During the process of preparation, students gather and organise the Information to be used in writing a text. This may involve a number of individual and group activities such as research and discussion. Teachers necessarily use those activities best suited to the demands of the students and the genre. The teacher then acts as a scribe for the class and helps turn student ideas into an approximation of the genre. This joint negotiation of a text will depend largely on the level of competence of the students given the degree of technical language and knowledge of the field. 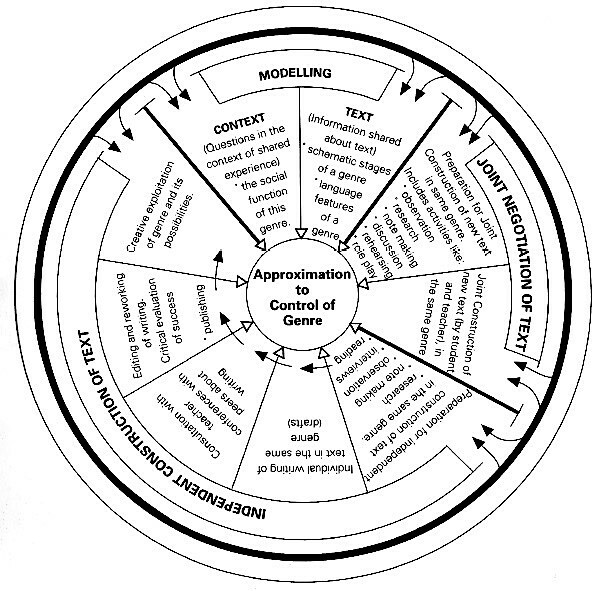 The concept of ‘approximation’, therefore, is essential to the cycle because of the aim of students having increasing control over the genre and its language features. In other words, the degree of approximation will depend on the familiarity of the genre and the language development of students. As students become more confident and familiar with the genre, there will be less need for teacher assistance and negotiation. This phase also helps link spoken and written language. This is achieved by the teacher acting as the scribe and moving through each of the generic stages with the students and negotiating with the students the appropriate information for the given stage. The teacher’s role is to take the students’ spoken language and, through careful negotiation, transform the speech into writing. At this point it is useful for teachers to review progress made before proceeding to independent construction. If the class did not handle the stage well, it would be worthwhile to return to the modelling phase and examine further model texts and then engage in more joint construction. ‘Independent construction’ of a text by students, the third stage in the curriculum cycle, involves a number of steps: from preparation through drafting, conferencing, editing and evaluating; to the creative manipulation of the genre and its possible uses. Without the previous stages, expectations that students can write will only be met by those students with substantial language resources already at hand. For students with limited control over written language, explicit guidance in understanding purpose, schematic structure and the language features of a genre is needed before they can launch into independent construction. Because these issues have been covered in earlier stages, students and teachers will have a shared language and knowledge with which to discuss the problems encountered in independent construction. It is also useful in this stage for teachers to implement activities which aim to expand field or content knowledge and knowledge of language features or grammar. It is important for teachers to evaluate the success of each step and stage, but it is particularly important to set up procedures during independent construction to assess students’ control of the genre and the success of the whole learning cycle, in order to indicate where the class needs to move next. A worthwhile final step is to have students explore the possibilities of the genre by working creatively within and beyond it. This is important not only because creativity is in itself a useful and necessary part of learning, but because it allows students to see how aspects of a genre, and their modification, affect the process of communication. Of course, the curriculum cycle is not a fixed, lock-step procedure. It allows teachers room to move with the space to develop activities and enter the cycle in a way that best meets students’ needs. It is possible to return to any stage where necessary and to spend as much time as is needed on each step. For example, it is possible to construct a number of texts jointly before initiating independent construction, or to return to the modelling phase at frequent intervals, or to have students work in small groups jointly constructing texts before writing on their own. The following series of lessons based on this cycle was designed for a Year 8 science class. The class was completing a unit on the greenhouse effect, which provided the basis for work on the genre of explanation. to demonstrate an understanding of the social purpose, generic structure and linguistic features of the explanation genre by writing an explanation in small groups. Explain how a gardener’s greenhouse works. Explain how a hydroelectric power station generates electricity. Explain how a coal fired power station generates electricity. Explain how a nuclear power station generates electricity. Explain how plants contribute to the greenhouse effect. Explain the process of photosynthesis. Explain how people contribute to the greenhouse effect. Explain what happens when people breathe. Explain what happens to life in the ocean when its temperature rises. Explain what happens to the climate when the atmosphere warms up. Explain how the coastline will be affected if the earth warms up. Explain how recycling helps reduce the greenhouse effect. The teacher led a class discussion based on the students’ commonsense understandings of the greenhouse effect — its causes and effects and whether it was a reality or simply a media ‘beat-up’. They also discussed what could be done to control the greenhouse effect; on a personal level and indeed if it was the responsibility of individuals at all or rather the responsibility of large corporations and governments as perhaps they were most responsible for causing the global warming. From the points the teacher recorded during the discussion, an assessment of the students’ level of understanding of the greenhouse effect was made. The lesson concluded with the class deciding to hold a role play to explore the issues from a range of perspectives. The students were to research the topic by collecting newspaper clippings and watching the news to gather information on greenhouse and global warming. This lesson was devoted to a follow-up of the previous lesson with the class group pooling the data they had collected and establishing a data bank. By way of summary, the teacher introduced the concept of scientific language to explain natural phenomena. She briefly talked about the explanation genre and how it was commonly used in science. She then read the following text as a model, pointing out that it was an example of the explanation genre. Heat energy from the Sun warms the Earth. As this energy reaches the Earth’s atmosphere, most of it is reflected back to space, a small amount is absorbed, while the rest reaches the Earth. Some of this heat energy is absorbed to warm up its surface and the rest is reflected back into the atmosphere. When the heat is reflected back from the Earth’s surface a lot of this energy is absorbed by the gases in the atmosphere. This helps keep the planet warm. The Earth’s atmosphere acts like a blanket of insulation allowing sunlight through to heat the Earth, while trapping the warmth that radiates back to space. In this way the atmosphere works like a greenhouse — except a greenhouse uses glass or perspex instead of gas — and that is why it is called the greenhouse effect. The greenhouse gases in the atmosphere help maintain the right temperature on Earth to sustain life. When too many of these gases are present in the atmosphere, too much heat energy is trapped, causing the Earth’s temperature to rise. Air pollution produces an increase in the quantity of the greenhouse gases in the atmosphere which causes the earth to overheat. This session was a double period practical lesson where the class used several aquaria to build model greenhouses in which to conduct experiments taking temperature readings both inside and outside the greenhouses. They then conducted a simple experiment to demonstrate that during photosynthesis plants give off water vapour and carbon dioxide. Aim: Write a short sentence to show what we were trying to find out in the experiment. Start with the word To. . . Method: Write the steps you followed in the experiment. Begin each step with the action word that tells the reader what to do and remember to write it in the present tense. Don’t forget to number the steps. Result: Write and tell the reader what happened. In here you can include a table of figures to show the results and then write a sentence summarising the results. Conclusion: Write down some general statements to show what you discovered by doing the experiment. Why would someone write this? What occupation do you think would require a person to write this type of writing? Where is the reader told what this text is about? Where is the reader told what happens to the Sun’s energy when it reaches the Earth’s atmosphere? What part of the text tells the reader what happens to the Sun’s heat energy once it is reflected back from the Earth’s surface? Who can read out the words that tell the reader the actions that are going on? Can you see how these words divide the text up into the steps of the Greenhouse Effect? Who can tell us what these steps are? Are there any other words that tell the reader that the process is moving from one stage to another? how in some processes one action leads to another and so on till a final state or stage is reached. She then told the students that this type of sequence is characteristic of scientific explanations. This was exemplified with reference to a number of processes, and the following general principle was used to reinforce the point. An implication sequence can be expressed as: if step 1, then step 2; if steps 1 and 2, then step 3; if steps 1, 2 and 3, then step 4; and so on. The class then matched this principle to the processes involved in global warming and was asked to outline the various steps involved. The class was then given a number of texts. In small groups, they had to decide which were explanations and which were not, justifying their choices with reference to the purpose of the text and any other criteria they felt were relevant. In this session students completed a stencil using the information provided in the greenhouse text. The lesson was designed to reinforce the generic structure of the explanation genre. The students studied diagrams of the carbon and nutrient cycles to develop their understanding of the greenhouse effect. They were given a table to complete for homework. The class then went to the library with a series of questions to answer. Session 9: More Field Knowledge During this session the class continued their research in the school library. Who discovered the hole in the ozone layer? What is causing ozone layer depletion? What are the effects of ozone layer depletion? How does ozone layer depletion contribute to the greenhouse effect? How are people trying to repair the damage to the ozone layer? The teacher and class then decided which information would fit under each heading. During this lesson the teacher acted as scribe and the class and teacher jointly wrote their text about ozone layer depletion. This lesson was devoted to reading in the library where the students searched for information for their independent topics. The teacher used this session to focus on some of the grammatical features of the explanation genre. She began by talking about different types of words. Using the text that the class had jointly written, she drew attention to the process words, explaining that the actual scientific process is realised through these words in explanations. The class did some cooperative cloze exercises using a number of explanations to focus on the process types. Here the students were able to see how some of the process words signalled that the genre was moving to another stage. What will happen to the oceans if the Earth warms? What will happen to the climate if the atmosphere warms? What will happen to plants if there is an increase in carbon dioxide and the atmosphere warms up? How does plant life in the oceans influence the greenhouse effect? These experiments were performed in small groups and at the end of the session those groups which had obtained results explained their experiments to the rest of the class and shared their results. The others simply explained what their experiments were designed to discover. The students used this session to write up the results of their experiments and those who did not obtain results in the last session reported on the results of their experiments. In this session the teacher modelled the function of conjunction in explanations as further preparation for the students to write their own texts. In this session the students were given time to write their own explanation in groups and the teacher provided assistance to individual groups. What is the evidence to suggest that the globe is actually warming? Is this evidence sufficient or are certain scientists and lobby groups using limited local variations in climate to argue a case for their own political ends? Is the fact that [our] climate has undergone some extremes over the last three years sufficient evidence to support the notion of a greenhouse effect? Is the explanation genre a suitable way to explain natural phenomena or would it be better to adopt another genre — for example, a narrative similar to the traditional aboriginal dreamtime stories? Does the way the explanation genre presents information give the scientific knowledge more credence than it deserves? Callaghan, Mike, Peter Knapp, and Greg Noble. 1993. “Genre in Practice.” in The Powers of Literacy: A Genre Approach to Teaching Writing, edited by B. Cope and M. Kalantzis. London: Falmer Press, pp.11, 180-189.